Love this program..... easy to use, very fast and far better and easier to use then the vendor supplied program that came with the camera, and the renaming feature is great. I must say that the new 4.0 is sweeter than ever. I didn't think cam2pc could be improved upon but you certainly did it. On my new computer I haven't even bothered installing any of the software that came with the camera - just cam2pc. Having trouble with the software that came along your digital camera? You have come to the right place! cam2pc has all the features you may need to work faster than ever with your digital pictures. With cam2pc, digital imaging get as simple as it gets! 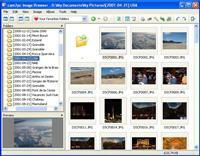 The Image Browser of cam2pc lets you browse your PC for all your pictures. Because we believe that media organization starts with a good folder and file hierarchy, cam2pc is built like Windows Explorer : navigating through your folders and knowing where your photos are located on your PC, makes your job easier whenever you want to use your pictures in another software than cam2pc. The Image Browser allows you to quickly access EXIF information stored in your pictures. This information, written by your camera, contains precious information about your pictures : date and time of shooting but also photgraphic information like focal, exposure time or white balance settings. From the Image Browser you can access most of the features of cam2pc. 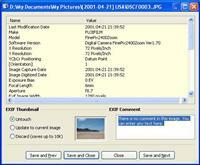 This includes a some basic image processing features like image conversion or resizing. All these features can work in batch mode meaning that you can process several images at a time. More creative features are also available like the ability to add nice borders and drop shadows to your images. Finally, the intuitive image retouching module of cam2pc lets you fix with just a few clicks bad exposure, color casts or even red eyes in your images. The Image Downloader has made the renown of cam2pc. Fully packed with all the options you may need, cam2pc allows you to perfectly organize your media files on your hard drive, allowing you to quickly find them back. Name the folder to copy your files to and even rename your pictures exactly the way you want it or rotate automatically the pictures you have taken in portrait mode (on compatible cameras) are part of the options available. Albums offer a virtual view over your images: group images from different folders to organize them by theme for instance. With a simple drag and drop, you can quickly create albums, the start point to content creation and media sharing. What's the point of taking all these photos without sharing them with your family and friend? cam2pc offers a great variety of sharing modes. 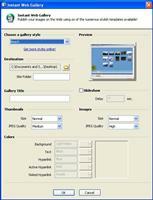 From simple image mailing to instant web galleries or even movies creation, cam2pc offers it all. You can even create slideshows with transition effects that you can easily send by mail or burn on a CD without worrying if the recipient will have the necessary software to view them: when cam2pc creates a slideshow it automatically includes a fullscreen viewer offering the best viewing quality.